This easy to sew design is especially made for mediumweight print or textured linen, cotton blend or faille fabrics. 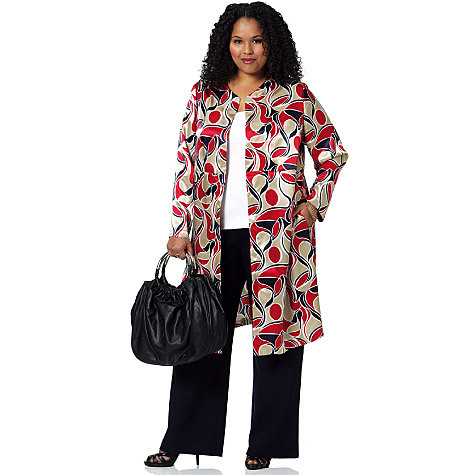 The slim fitting jacket A or vest B have simple lines, side seam pockets and side seam slits. It´s detailed with topstitching for a finished look. Wide legged pull-on pants C have elastic waist casing and side seam pockets. Purchased top. Notions description...NOTIONS: Pants C: 11/4" Elastic: 11/4 yds. for Misses´ and 13/4 yds. for Women´s. Linen, Cotton Blends and Faille.